School officials addressed an incident today at Lewis County Middle School in which a student brought a small caliber bullet to the school and displayed it to some friends. Superintendent Jamie Weddington said the incident was addressed quickly and added proper procedures were adhered to and administrators confiscated the single bullet and contacted law enforcement. Weddington stressed there was never a threat to students or other personnel at the school and at no time was anyone in danger. 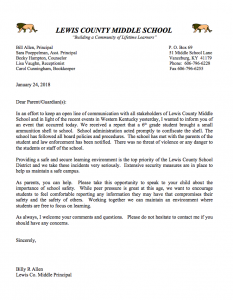 LCMS Principal Bill Allen sent a letter to parents and guardians of students. Allen was referring to an incident Tuesday at Marshall County High School in which 15 people were shot, two of them fatally. “We received a report that a 6th grade student brought a small ammunition shell to school,” he wrote. “School administration acted promptly to confiscate the shell. The school has followed all board policies and procedures. The school has met with the parents of the student and law enforcement has been notified. There was no threat of violence or any danger to the students or staff of the school,” Allen added. Weddington said the incident reportedly resulted after the student discovered the bullet in a pocket in which he had previously carried ammunition during activities away from the school. “As parents, you can help,” Allen wrote in the letter. “Please take this opportunity to speak to your child about the importance of school safety. While peer pressure is great at this age, we want to encourage students to feel comfortable reporting any information they may have that compromises their safety and the safety of others,” he added.